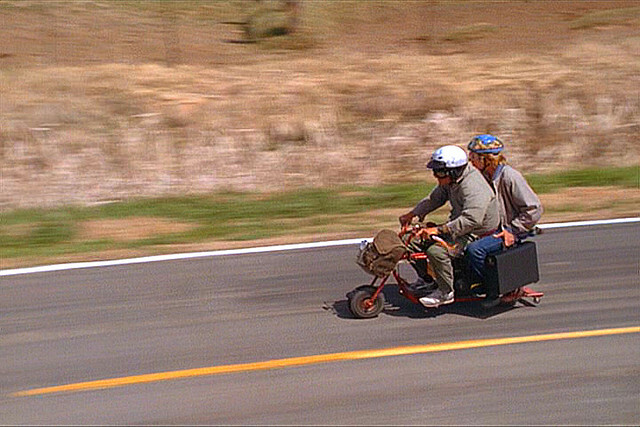 Everyone remembers the Dumb and Dumber scene where they ride a mini bike across the Midwest to Aspen. In the fictitious movie, it was roughly 500 miles that they rode and on a mini bike engine that had somewhere between 150- 200 cc's ( cubic centimeters). My idea will be to go almost triple that on 1/3 the cc's. I am hoping to have a live web cam broadcast so you can log on and watch my progress any time during the day. You can do it! If anyone can, and has the will, you sure do! Hugzzz for the way my friend!